Avian leukosis virus (ALV) is a retrovirus that causes tumors in avian species, and its vertical and horizontal transmission in poultry flocks results in enormous economic losses. Despite the discovery of specific host receptors, there have been few reports on the modulation of viral susceptibility via genetic modification. We therefore engineered acquired resistance to ALV subgroup B using CRISPR/Cas9-mediated genome editing technology in DF-1 chicken fibroblasts. Using this method, we efficiently modified the tumor virus locus B (tvb) gene, encoding the TVB receptor, which is essential for ALV subgroup B entry into host cells. By expanding individual DF-1 clones, we established that artificially generated premature stop codons in the cysteine-rich domain (CRD) of TVB receptor confer resistance to ALV subgroup B. Furthermore, we found that a cysteine residue (C80) of CRD2 plays a crucial role in ALV subgroup B entry. These results suggest that CRISPR/Cas9-mediated genome editing can be used to efficiently modify avian cells and establish novel chicken cell lines with resistance to viral infection. Avian leukosis virus (ALV) is a retrovirus that infects avian species, eventually causing tumors . The ALV is a group VI virus of the family Retroviridae, and it can be divided into six subgroups, A–E and J, based on retroviral envelope glycoproteins that play a crucial role in host–virus interactions . ALV-infected poultry display several symptoms, including lymphoblastic, erythroblastic and osteopetrotic tumors, and the virus can be transmitted both vertically and horizontally. The spread of ALV in poultry flocks therefore causes tremendous economic losses within the poultry industry . Susceptibility and resistance to the virus depend largely on specific host receptors that interact with viral envelope proteins. Naturally occurring genetic mutations in the host receptors, or artificial expression of mutant receptors in host cells, can affect susceptibility to the virus. A four base pair (bp) insertion and 1 bp substitution in the tumor virus locus A (tva) gene confer resistance to ALV subgroup A , and mutations in the first intron of tva are also reported to reduce susceptibility to ALV subgroup A [5, 6]. Chickens with a 1 bp substitution in tvb creating an in-frame stop codon exhibit complete resistance to ALV subgroup B, and a single amino acid substitution (C125S) reduces susceptibility to ALV subgroups B, D and E [7, 8]. Resistance to ALV subgroup C is closely related to a 1 bp substitution in tumor virus locus C (tvc) that creates an in-frame stop codon . Moreover, comparative studies suggest that variation in tryptophan 38 (W38) in the NHE1 gene explains the differences in susceptibility to ALV subgroup J among avian species [10, 11]. Despite the discovery of specific host receptors that are critical for ALV entry, there has been only one report on the acquisition of resistance to ALV subgroup C in avian species via genome editing of host receptor genes. This can be attributed partly to the lack of an efficient genome editing technology . The recently developed clustered regularly interspaced short palindromic repeats (CRISPR)/CRISPR-associated (Cas9) system is a programmable genome editing technology  that has been widely adopted for use in many organisms, including mice, fish, pigs and cows [13–16]. Among avian species, CRISPR/Cas9 has also been used successfully for genome editing in chickens [17, 18]. We performed genome editing on the chicken host receptor gene tvb, which is related specifically to ALV subgroup B. Since chickens with premature stop codons in CRDs of TVB receptors exhibit resistance to ALV subgroup B, we sought to identify artificial mutations in CRDs of TVB receptors that cause similar effects . We adopted the CRISPR/Cas9 system, an efficient programmable genome editing tool, for use in DF-1 chicken fibroblasts. We then evaluated the susceptibility of genetically modified hosts to ALV subgroup B using flow cytometry. The care and experimental use of chickens were approved by the Institute of Laboratory Animal Resources, Seoul National University (SNU-150827-1). Chickens were maintained according to a standard management program at the University Animal Farm, Seoul National University, Korea. The procedures for animal management, reproduction and embryo manipulation adhered to the standard operating protocols of our laboratory. We constructed all-in-one CRISPR/Cas9 vectors targeting tvb, with minor modifications. The CRISPR kit used for constructing multiplex CRISPR/Cas9 vectors was a gift from Takashi Yamamoto (Addgene Kit #1000000054) , and a neomycin resistance gene under the regulation of a thymidine kinase promoter was inserted into CRISPR/Cas9 vectors by NotI digestion and ligation (New England Biolabs, Ipswich, MA, USA). For the insertion of guide RNA sequences into CRISPR/Cas9 vectors, we synthesized sense and antisense oligonucleotides (Bionics, Seoul, Korea) and carried out annealing using the following thermocycling conditions: 30 s at 95 °C, 2 min at 72 °C, 2 min at 37 °C and 2 min at 25 °C. The oligonucleotides used are listed in Table 1. DF-1 cells were maintained and subpassaged in Dulbecco’s minimum essential medium (DMEM; Hyclone, Logan, UT, USA), supplemented with 10% fetal bovine serum (FBS; Hyclone) and 1× antibiotic–antimycotic (ABAM; Thermo Fisher–Invitrogen, Carlsbad, CA, USA). DF-1 cells were cultured in an incubator at 37 °C in an atmosphere of 5% CO2 at 60–70% relative humidity. All internal organs and limbs were removed from WL chicken embryos of 6-day-incubated fertilized eggs, and the remaining embryonic body was then dissociated using 0.05% (v/v) trypsin/ethylenediaminetetraacetic acid (Gibco, Grand Island, NY, USA) at 37 °C for 15 min. The limbs were used for genomic DNA extraction, and the dissociated cells were filtered through 70 mm nylon mesh filters and cultured in DMEM (Hyclone) containing 10% FBS (Hyclone) and 1% ABAM (Thermo Fisher–Invitrogen) in a 5% CO2 atmosphere at 37 °C . CRISPR/Cas9 vectors (3 µg) were mixed with Lipofectamine 2000 reagent (Thermo Fisher–Invitrogen) in Opti-MEM (Thermo Fisher–Invitrogen), and the mixture was applied to 5 × 105 DF-1 cells. Then, 6 h after transfection, transfection mixtures were replaced with DF-1 culture medium. Geneticin® Selective Antibiotic (G418; GIBCO Invitrogen, Grand Island, NY, USA) (300 µg/mL) was added to the culture medium 1 day after transfection. The complete selection period required up to 7 days. We adapted the T7E1 assay method from previous publications with minor modifications . Genomic DNA was extracted from DF-1 cells after G418 selection. Genomic regions encompassing the CRISPR/Cas9 target sites were amplified using specific primer sets (Table 1). The amplicons were reannealed to form a heteroduplex DNA structure after denaturation. Subsequently, the heteroduplex amplicons were treated with 5 units T7E1 endonuclease (New England Biolabs) for 20 min at 37 °C and then analyzed by 1% agarose gel electrophoresis. After G418 selection, single DF-1 cells from the DF-1 cells treated with CRISPR vectors were seeded in individual wells of a 96-well plate with 100 µL culture medium. We checked the wells each day after seeding and, when the cells in each well were confluent, subpassaged the cells into a 48-well plate. These cells were then used for genomic DNA extraction. The genomic regions encompassing the CRISPR/Cas9 target sites in DF-1 and WL CEFs were amplified using specific primer sets (Table 1), and the PCR products were sequenced using the ABI Prism 3730 XL DNA Analyzer (Thermo Fisher–Applied Biosystems, Foster City, CA, USA). The sequences were analyzed against assembled genomes using BLAST (http://blast.ncbi.nlm.nih.gov). RCASBP-(B)-CN-EGFP was kindly provided by Dr. Yao and Dr. Nair (Pirbright Institute). CRISPR/Cas9 vectors (5 µg) were mixed with Lipofectamine 2000 reagent (Thermo Fisher–Invitrogen) in Opti-Mem (Thermo Fisher–Invitrogen), and the mixture was applied to 1 × 106 DF-1 cells. The mixture was replaced with DF-1 culture medium 6 h after transfection. One day after transfection we could detect green fluorescence in DF-1 cells, which indicated virus production. Cells were subpassaged, and the medium was changed 1 day after subpassaging. One day later, the medium containing virus was harvested and frozen at −70 °C until use. For viral infection, the medium containing virus was thawed at 37 °C and added to individual DF-1 and WL CEF clones. Four days post-infection, DF-1 and WL CEFs were observed using fluorescence microscopy (TU-80; Nikon, Tokyo, Japan) and analyzed using FACSCalibur (BD Biosciences, San Jose, CA, USA). The protein sequences and bisulfide bond structures of human DR5 TRAIL receptor (NP_003833.4), mouse Tnfrsf10b (NP_064671.2), western clawed frog tnfrsf10b (NP_001004894.1), chicken TVBS1 (NP_989446.2) and chicken TVBS3 were analyzed using ClustalW. Statistical analysis system (SAS) software was used for analysis of ALV subgroup B susceptibility. Each treatment was compared using the least-squares method or Duncan’s method, and the significance of the main effects was determined using analysis of variance in the SAS package. A p value < 0.05 was regarded as statistically significant. To produce ALV subgroup B in chicken DF-1 cells, cells were transfected with the RCASBP-(B)-CN-EGFP vector. This vector contains a green fluorescent protein (GFP)-expressing cassette with ALV subgroup B gag, env and pol genes (Figure 1A). This allowed us to assess virus production in DF-1 cells based on GFP expression compared with wild type (WT) DF-1 cells (Figure 1B). Schematic representation of this study and virus production in DF-1 cells by RCAS vectors. A Overview of this study. The CRISPR/Cas9 vectors including Cas9 protein-coding sequences, tvb-targeting guide RNA and neomycin resistance genes were transfected into DF-1 cells. After G418 selection, T7E1 assays and TA cloning were performed. tvb-modified single DF-1 cells were cultured in 96-well plates, and tvb from individual DF-1 clones was sequenced. Clones were infected with ALV subgroup B produced by RCASBP-(B)-CN-EGFP vector-transfected DF-1 cells. B ALV subgroup B production in DF-1 cells. DF-1 cells transfected with RCASBP-(B)-CN-EGFP vectors expressed green fluorescent protein (GFP). Non-transfected DF-1 cells (WT) used as negative control. Scale bar = 200 µm. To efficiently disrupt tvb, we designed two CRISPR/Cas9 vectors targeting two different sites within the gene. The TVB#1 vector (TVB#1) was designed to target the ATG sequence of tvb, which can inhibit gene translation. The TVB#2 vector (TVB#2) was designed to target exon 3 of tvb, which can cause frame shift mutations resulting in production of a stop codon in CRDs of TVB receptors  (Figure 2A). DF-1 cells transfected with TVB#1 and TVB#2 were successfully selected 7 days post-transfection using G418, and T7E1 analysis showed that the transfected cells had indel mutations in targeted loci (Figure 2B). The mutations were analyzed using the TA cloning method, and the mutation efficiencies of the two targeted loci were 70 and 45.5% in DF-1 cells transfected with TVB#1 and TVB#2, respectively (Figure 2C). The patterns of mutations were diverse in both experimental groups. In DF-1 cells transfected with TVB#1, we identified both deletions and insertions. In DF-1 cells transfected with TVB#2, only deletions mutations were identified (Figure 2C). Genetic modification of tvb by CRISPR/Cas9 in DF-1 cells. A Gene structure of tvb (TNFRSF10B) and recognition sites of TVB#1 and TVB#2 CRISPR/Cas9 vectors. Blue bars indicate guide RNA recognition sites, and red bars indicate protospacer-adjacent motif (PAM) sequences. Scale bar = 1 kb. B T7E1 assay for DF-1 cells transfected with TVB#1 and TVB#2 CRISPR/Cas9 vectors. Bands cleaved by T7E1 endonuclease were seen in the experimental groups. C Sequencing analysis of transfected DF-1 cells using the TA cloning method. Grey letters indicate insertions, and grey letters with lines indicate deletions. Indel mutations and their frequencies are presented. 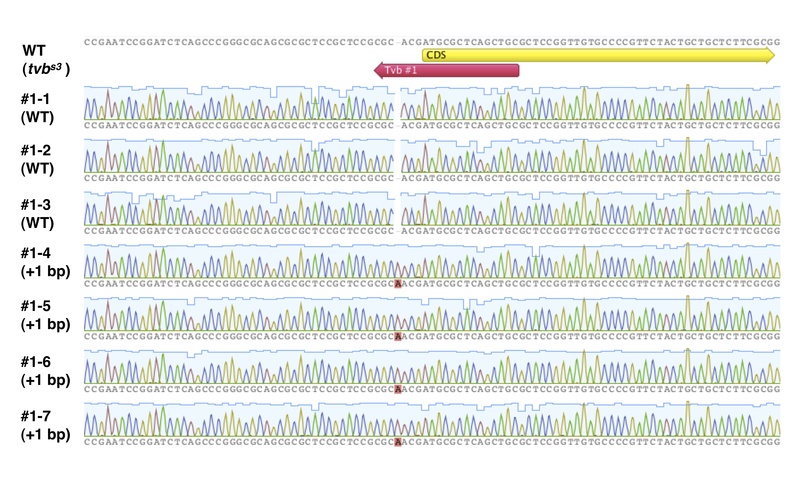 Blue bars indicate guide RNA recognition sites, and red bars indicate PAM sequences. Wild type (WT) DF-1 cells were used as the control. To establish single tvb-mutated DF-1 clones, we picked single cells from DF-1 cells transfected with TVB#1 and TVB#2, respectively. The picked single cells became attached and actively proliferated (Additional file 1: A). We established several different clones from both TVB#1- and TVB#2- transfected DF-1 cells. Unfortunately, we obtained only clones with a 1 bp insertion before the ATG sequence from DF-1 cells transfected with TVB#1 (Additional file 2); therefore, we evaluated only the clones from DF-1 cells transfected with TVB#2. 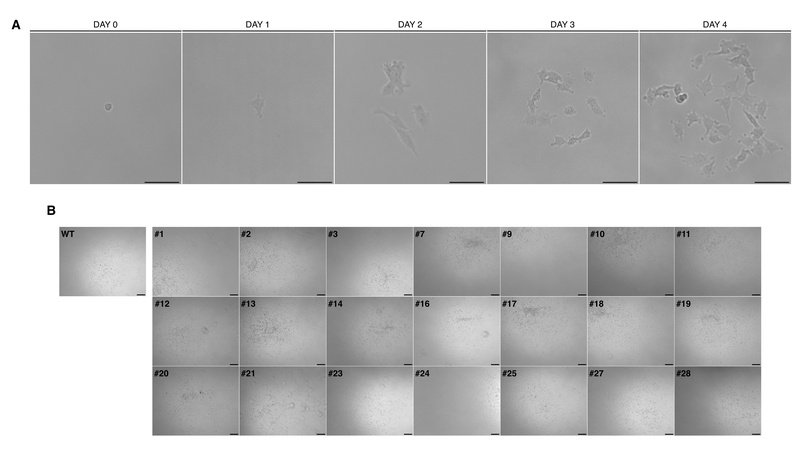 For 3‒4 weeks, a total of 21 clones from DF-1 cells transfected with TVB#2 were established (Additional file 1: B), and the clones were then sequenced. Sequencing of the PCR products revealed a single clear peak in all samples, indicating that all DF-1 clones had diverse bi-allelic mutation patterns (Table 2; Additional file 3). Specifically, clone #17 had a 44 bp insertion in targeted loci, and clones #13, #16 and #28 had 15, 12 and 15 bp deletions, respectively, which could not induce frame shift mutations. Other clones (#2, #10, #14, #18, #19, #21, #23, #25 and #27) had deletions in targeted loci that caused frame shift mutations (Table 2). To verify the susceptibility of DF-1 clones to ALV subgroup B infection, clones from DF-1 cells transfected with TVB#2 were infected with ALV subgroup B. Strong GFP expression was detected in nine different clones (#1, #3, #7, #9, #11, #12, #16, #20 and #24) compared with WT DF-1 cells at 4 days post-infection. We also found markedly lower levels of GFP expression in clones #2, #10, #14, #17, #18, #19, #21, #23, #25 and #27 and moderate levels of GFP expression in clones #13 and #28 (Figure 3A). The results of flow cytometric analysis showed that the proportions of GFP-expressing cells in DF-1 clones #1, #3, #7, #9, #11, #12, #16, #20 and #24 were 82.6, 93.8, 96.1, 87.9, 98.7, 97.6, 91.8, 97.1 and 85.8%, respectively. The proportions of GFP-expressing cells in clones #2, #10, #14, #17, #18, #19, #21, #23, #25 and #27, which exhibited low levels of GFP expression, were 9.3, 5.9, 10.9, 8.3, 13.1, 12.8, 6.5, 6.5, 6.7 and 6.2%, respectively. The proportions of GFP-expressing cells in clones #13 and #28, which exhibited moderate levels of GFP expression, were 53.3 and 49.2%, respectively (Figures 3B and C). Viral infection of DF-1 clones and flow cytometric analysis. A GFP expression in virus-infected DF-1 cells. Twenty-one DF-1 clones were evaluated under a fluorescence microscope. Scale bar = 200 µm. B, C Flow cytometric analysis of virus-infected DF-1 clones. WT DF-1 cells were used as the control. To identify the reason for the significantly reduced ALV group B susceptibility in tvb-mutated DF-1 clones, we analyzed their amino acid sequences. First, we compared the sequence of tumor necrosis factor receptor superfamily member 10B (TNFRSF10B) among humans, mice, frogs and chickens (TVBS1 and TVBS3). Sequence alignment analysis revealed highly conserved amino acid sequences in CRDs located in the extracellular receptor domain and cytoplasmic death domain (DD), which mediates the apoptosis signaling pathway. In particular, we located highly conserved cysteine residues in CRDs that formed bisulfide bonds (Figure 4A). Analysis of deduced amino acid sequences of tvb -modified DF-1 clones. A Sequence alignment of human DR5 TRAIL receptor (NP_003833.4), mouse Tnfrsf10b (NP_064671.2), western clawed frog tnfrsf10b (NP_001004894.1) and chicken TVBS1 (NP_989446.2). Blue boxes indicate cysteine-rich domains (CRDs) and death domains (DDs); shaded boxes indicated similarities among amino acid sequences. Asterisks indicate conserved cysteine residues. B Sequence alignment of deduced amino acids in tvb-modified DF-1 clones. Red boxes indicate conserved cysteine residues, and numbers indicate the order of the amino acids in TVB proteins. Asterisks indicate stop codons. WT with tvb s1 , tvb s3 and tvb r genotypes were used as the control. Next, we deduced the amino acid sequences of tvb-mutated DF-1 clones. Amino acid sequence analysis showed that clones #10, #14 and #18 shared the same amino acid sequences, as did clones #21, #23 and #25. Clones had mutations that generated an in-frame stop codon resulting in the production of a truncated protein similar to that of the WT tvb r . Clones #13 and #28, which expressed moderate levels of GFP, possessed the same mutations, including five amino acid deletions and one amino acid substitution from the 77th to 82nd amino acid positions of the TVB receptor. Clone #16, which expressed high levels of GFP, had four amino acids deletions from the 76th to 79th amino acid positions of the TVB receptor (Figure 4B). The mutations of nucleotides and deduced amino acids, and results of virus challenge in tvb-modified DF-1 clones were summarized in Table 3. The acquisition of complete disease resistance is the ultimate goal of the agricultural industry and human society. However, despite the development of vaccines and improvements in quarantine facilities, complete disease control is elusive owing to economic costs and the rapid evolution of viruses. To overcome these limitations, targeted DNA modification using CRISPR/Cas9 technology has been used against a variety of viruses [22–27]. This system specifically targets and modifies the structure of viral genomes or host viral receptor genes and may therefore be used for efficient viral disease prevention without off-target events . Therefore, in the present study, we used the CRISPR/Cas9-mediated genome editing method to confer resistance to ALV subgroup B in DF-1 chicken fibroblasts. To evaluate the feasibility of CRISPR/Cas9-mediated genome editing for engineering resistance to ALV subgroup B, we first designed two CRISPR/Cas9 vectors specifically targeting two tvb loci for genetic mutations (Figure 2A). Chickens that have a naturally occurring single bp mutation in tvb are reported to be resistant to infection by ALV subgroups B, D and E, and this is thought to be because of the creation of a premature stop codon in the CRD1 domain . To artificially generate a premature stop codon in tvb in DF-1 cells, we targeted the 3’ region of the CRD1 coding region. We also targeted the tvb start codon to achieve total disruption of tvb receptor protein production. We found that targeted loci were successfully modified to possess indel mutations, and most mutations occurred in regions neighboring protospacer-adjacent motif sequences, which is consistent with previous research (Figure 2C) . Next, we cultured DF-1 clones harboring tvb mutations to obtain clones with homozygous genotypes (Additional file 1). To avoid misinterpretation due to mixed genotypes during the virus challenge experiment, we verified DF-1 genotypes by sequencing analysis of PCR products. In total, 21 single DF-1 clones from TVB#2-transfected DF-1 cells were established. Of these, 12 had indel mutations in tvb, of which 11 were deletions, and only 1 was an insertion (Table 2). As previous research has reported, our results showed that the deletions were mostly CRISPR/Cas9-mediated mutations . Sequencing analysis showed that all DF-1 clones had bi-allelic mutations, which was also consistent with previous research (Additional files 2 and 3) [30, 31]. However, using TVB#1 we were able to obtain only DF-1 clones that had 1 bp insertions in the 5’ region (see Additional file 2). The sequencing results for TVA#1-transfected DF-1 cells suggested that more clones were required for analysis or that precise genome editing mediated by homologous recombination was required to obtain clones with mutations in ATG sequences. To evaluate the viral susceptibility of established single DF-1 cells, the cells were infected with ALV subgroup B produced by replication-competent ALV long terminal repeat (LTR) using a splice acceptor (RCAS) vector. The RCAS vector used in the present study is replication-competent in avian cells, and the vector spreads rapidly and infects most cells in vitro within a short period of time . Exploiting these characteristics, we successfully produced ALV subgroup B in DF-1 cells (Figure 1B). In the virus challenge experiments, single DF-1 clones with mutations (#2, #10, #13, #14, #17, #18, #19, #21, #22, #23, #25, #27 and #28) had significantly lower levels of GFP expression compared with WT DF-1 cells. This suggests that genetic modification of tvb affected ALV subgroup B susceptibility in DF-1 cells. However, in this paper, we could not get the absolute resistant against to ALV subgroup B. 5.9% (#10) was the least expression of GFP among the clones (Figure 3C). The results may come from different between genotype of chicken that has tvb r and those of tvb-modified DF-1 clones. Analysis of deduced amino acid shows tvb-modified DF-1 clones have still 59th cysteine residue that is important in ALV subgroup B entry . Precise modification of the DF-1 tvb gene to tvb r genotypes may cause absolute resistant to the virus. Furthermore, the results can come from difference between in vivo and in vitro system. Previous report revealed that the chickens that have resistant to ALV subgroup A do not have any proliferation of sarcomas even after 42 dpi even 40% of their CEF express GFP at 7 dpi by ALV subgroup A infection . The results suggest that there is difference between in vivo and in vitro validation. To identify resistance to ALV subgroup B, genome-edited chicken needs to be produced and validated comparing with the chickens that have tvb r genotype. Analysis of deduced amino acid sequences revealed that genetic modifications of tvb generated a premature stop codon in the CRD2 domain (Figure 4B). This suggested that the artificially generated stop codon plays a crucial role in ALV subgroup B entry into host cells, similar to virus-resistant WL CEFs . Resistance to human immunodeficiency virus (HIV) infection is also associated with mutations in a host receptor, CCR5. Individuals who have a 32 bp deletion that creates a premature stop codon in the CCR5 receptor are resistant to HIV [33, 34]. Therefore, our results support the notion that amino acid substitutions, particularly those that generate premature stop codons in host receptors, can abolish the functions of these receptors in viral interactions. Interestingly, DF-1 clone #16 contained 91.8% GFP-expressing cells, although tvb gene contained a 12 bp deletion. This suggests that the deletion of four amino acids from the 76th to 79th positions of the TVB receptor does not significantly alter viral susceptibility. Comparing this clone with clones #13 and #28, which possessed a 15 bp deletion, suggested that cysteine 80 and arginine 81 within the TVB receptor play an important role in ALV subgroup B entry into host cells. Indeed, cysteine residues in CRDs are crucial for viral entry in several organisms. For example, the attachment of herpes simplex virus (HSV), equine infectious anemia virus (EIAV), feline immunodeficiency virus (FIV) and rabies virus (RABV) to host cells is mediated by the CRDs of their specific TNF receptors (herpes virus entry mediator [TANFRSF14] for HSV and EIAV, Ox40 [CD134, TNFRSF4] for FIV and NTRp75 for RABV). Cysteine residues in these CRDs are highly conserved, and mutations in these residues cause conformational changes in the extracellular regions of the receptors, altering their affinity to ligands . In avian species, a cysteine-to-tryptophan substitution in the low-density lipoprotein receptor-like region of TVA drastically reduces the binding affinity of ALV subgroup A; similarly, a cysteine-to-serine mutation at position 62 in the TVBS3 receptor reduces susceptibility to ALV subgroup E [4, 36]. Collectively, the results of the present study and previous research suggest the importance of bisulfide bonds in CRDs mediated by cysteine residues. However, studies investigating the precise replacement of cysteine 80 by homologous recombination are required to provide further support for our hypothesis. In the present study, we demonstrated the feasibility of CRISPR/Cas9-mediated genome modification for engineering resistance to ALV subgroup B. We efficiently modified DF-1 chicken fibroblasts using the CRISPR/Cas9 system and confirmed that modified DF-1 cells acquired resistance to ALV subgroup B. These results indicate that generating premature stop codons in the CRDs of TVB receptors can alter viral susceptibility, and that cysteine residues forming bisulfide bonds in CRDs may play important roles in determining susceptibility to ALV subgroup B. Furthermore, our results show that the CRISPR/Cas9 system can be used to efficiently modify the avian genome and establish novel avian cell lines, including virus-resistant chicken cell lines, mediated by primordial germ cells with germline competency. Furthermore, we expect that this system will facilitate the study of virus-host interactions not only in avian species but also in humans, for example, HIV and its relationship with the human CCR5 co-receptor [33, 34]. HJY participated in study design and coordination. LHJ participated in the design of the study, carried out the experiments, and wrote the first draft of the manuscript. LKY carried out the experiments. PYH and CHJ were involved in statistical analysis and data interpretation. YY and NV were involved in data interpretation and in writing the final versions of the manuscript. All authors read and approved the final manuscript. This work was supported by a National Research Foundation of Korea (NRF) grant funded by the Korea government (MSIP) (No. 2015R1A3A2033826). Authors also acknowledge the funding support from the Royal Society International Professorships. 13567_2017_454_MOESM1_ESM.jpg Additional file 1. Establishment of tvb -modified DF-1 clones. (A) DF-1 cell morphology during in vitro culture. Scale bar = 50 µm. (B) Establishment of 21 individual DF-1 clones. Wild type (WT) DF-1 cells were used as the control. Scale bar = 200 µm. 13567_2017_454_MOESM2_ESM.jpg Additional file 2. Sequencing results of TVB#1-transfected DF-1 clones with chromatography. Wild type (WT) DF-1 cells with tvb s3 genotypes were used as the control. The red arrow indicates the guide RNA recognition site, and red rectangles indicate insertions in tvb. 13567_2017_454_MOESM3_ESM.jpg Additional file 3. Sequencing results of TVB#2-transfected DF-1 clones using chromatography. Wild type (WT) DF-1 cells with tvb s3 genotypes were used as the control. The red arrow indicates the guide RNA recognition site, and orange rectangles indicate specific single nucleotide polymorphisms in tvb.